The Pennsylvania 11-year-old boy is in coma after the bully schoolyard fight attack by his classmate. O'Neil is 6th grade student from Darby Township. His parents is now communicating to the authorities and school officials to know why the alleged attackers got off easily. According to report by ABC Action news on February 6, Bailey O'Neil, a 6th grader was allegedly beaten up by several students and was left with a broken nose and concussion. The worst part here is, one of the 11-year-old boy's attacker got only 2 days suspension and nothing follows. Bailey's father Rob O'Neill said, "Every day I'm trying to stay strong for him, but when you get into that hospital room and you're looking at him, I would trade places in a heartbeat. It's my buddy, you know," then added, "I want to hear his voice, his mother wants to hear his voice." The boy parents had Bailey checked out at the hospital, but something still wasn't right. Rob said, "He was sleeping. He was moody. He wasn't himself. He was angry a little bit. He wasn't really eating." After a few days, Bailey condition turn to worse and started having violent seizures. Bailey's parents told that he is an honor student, an athlete, and a big brother. Pennsylvania Police are now working and investigating the incident with school personnel to know if bullying is the main problem in that school. 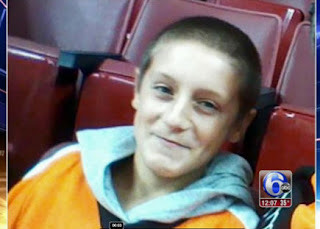 Comments or suggestions about "Bullied 11-year-old Boy is in Coma | Pennsylvania" is important to us, you may share it by using the comment box below.